C. Guyton A, E. Hall J. Textbook of Medical Physiology. 12th ed. Philadelphia: Elsevier; 2011. M. Anderson D. Dorlandâ€™s Illustrated Medial Dictionary. In: 32nd ed. USA: Elsevier; 2012. Barrett K, Brooks H, Boitano S, Barman S. Ganongâ€™s Review of Medical Physiology. 23rd ed. USA: Lange; 2010. Lauralee S. Human physiology: From cells to system. 7th ed. California: Brooks/Cole; 2010. Stanley M, Gauntlett Beare P. Buku Ajar Keperawatan Gerontik. 2nd ed. Jakarta: EGC; 2007. 502 p.
Buxton OM, Marcelli E. Social Science & Medicine Short and long sleep are positively associated with obesity , diabetes , hypertension , and cardiovascular disease among adults in the United States. Soc Sci Med. 2010;71(5):1027â€“36. Gangwisch JE, Heymsfield SB, Boden-albala B, Buijs RM, Kreier F, Pickering TG, et al. Short Sleep Duration as a Risk Factor for Hypertension Analyses of the First National Health and Nutrition Examination Survey. Hypertension. 2006;47:833â€“9. Fung MM, Peters K, Redline S, Ziegler MG, Ancoli-Israel S, Barrett-Connor E, et al. Decreased slow wave sleep increases risk of developing hypertension in elderly men. Hypertension. 2011;58(4):596â€“603. Hwang H, Lee J, Lee S, Cha KS, Choi JH, Jeong D, et al. 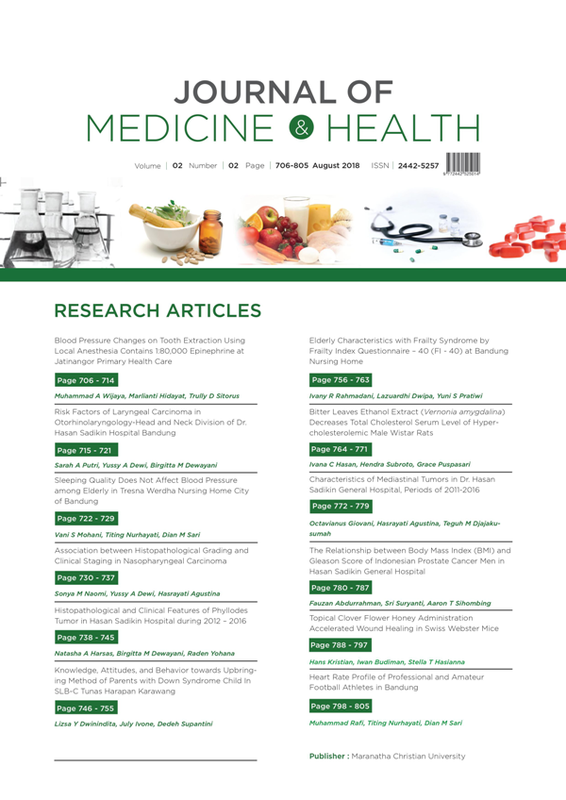 The relationship between hypertension and sleep duration : an analysis of the fifth Korea National Health and Nutrition Examination Survey ( KNHANES V-3 ). Clin Hypertens. 2015;21:8. Ji-rong Y, Hui W, Chang-quan H, Bi-rong D. Association between sleep quality and arterial blood pressure among Chinese nonagenarians / centenarians. Med Sci Monit. 2012;18(3):36â€“42. Carole Smyth. The Pittsburgh Sleep Quality Index ( PSQI ). Hartford Inst Geriatr Nurs. 2012;29(6):1â€“2. C. Kovell L, M. Ahmed H, Misa S, P. Whelton S. US Hypertension Management Guidelines: A Review of the Recent Past and Recommendations for the Future. J Am Heart Assoc. 2015;4. Berg JF Van Den, Tulen JHM, Neven AK, Hofman A, Miedema HME, Witteman JCM, et al. Sleep Duration and Hypertension Sleep Duration and Hypertension Are Not Associated in the Elderly. Hypertension. 2007;50:585â€“9. Wang D, Zhou Y, Guo Y, Zhang R, Li W, He M, et al. The effect of sleep duration and sleep quality on hypertension in middle-aged and older Chinese: the Dongfeng-Tongji Cohort Study. Sleep Med. 2017;40:78â€“83. Guo J, Fei Y, Li J, Zhang L, Luo Q, Chen G. Gender- and age-speci fi c associations between sleep duration and prevalent hypertension in middle-aged and elderly Chinese : a cross-sectional study from CHARLS 2011 â€“ 2012. BMJ Open. 2016;6:e011770.